In its latest report about the state of LTE networks around the world, OpenSignal has some mixed news for cellular subscribers in India. Named ‘The State of LTE (February 2018)’, the report reflects the cumulative results of 50 billion speedcheck measurements collected in the 4th quarter of 2017 to compare 4G performance in 88 countries. 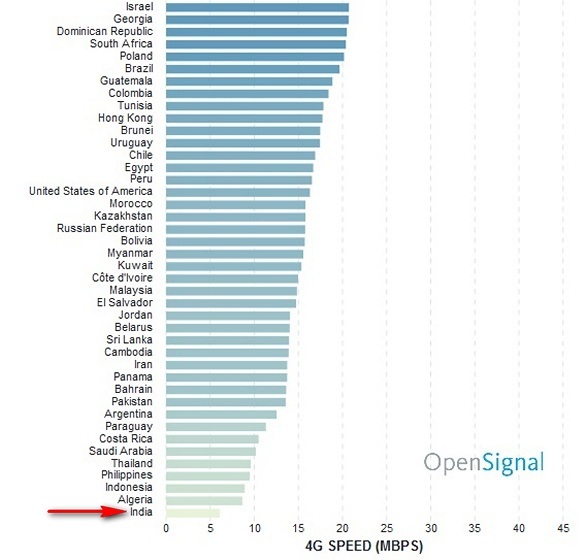 According to the report, Indians have access to 4G networks almost 86.26 percent of the time – OpenSignal’s availability metric tracks the proportion of time users have access to a particular network. India is 14th on the list in terms of availability, ahead of the likes of UK, Switzerland, Belgium, Spain and Singapore. On the flip side, the speeds are terrible. The combination of high demand in populous cities and the lack of advanced networking features, such as carrier aggregation, 4×4 MIMO and massive MIMO, means that the country continues to lag behind other nations in terms of overall speed. In fact, India came in dead last among 88 nations in terms of average speeds, clocking a mere 6.07Mbps download speeds, even as Singaporeans are apparently enjoying average speeds in excess of 44Mbps, making the country the number one on the list. 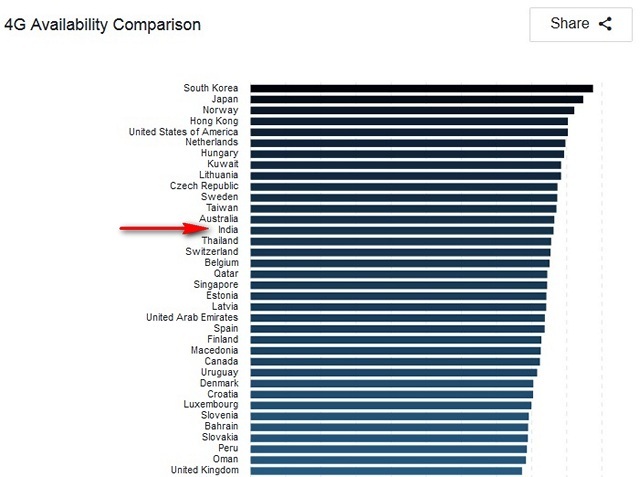 Neighbors Sri Lanka, Pakistan are not just better; they boast twice the average LTE speeds of India. Whether things improve with the introduction of 5G remains to be seen, but even if it does, it’s still a long way away, so it will be interesting to see if we continue to suffer till then. However, with prices as affordable as they are (thanks largely to Reliance Jio), not many are complaining, given that we were paying around 60 times as much for each GB of 3G data not so long ago. While speeds will very likely continue to remain subdued at least in the short term, the fact that India on the verge of hitting 90 percent availability is an especially commendable achievement, given our massive population. OpenSignal had earlier predicted that India will have 100% 4G penetration by the end of 2018.